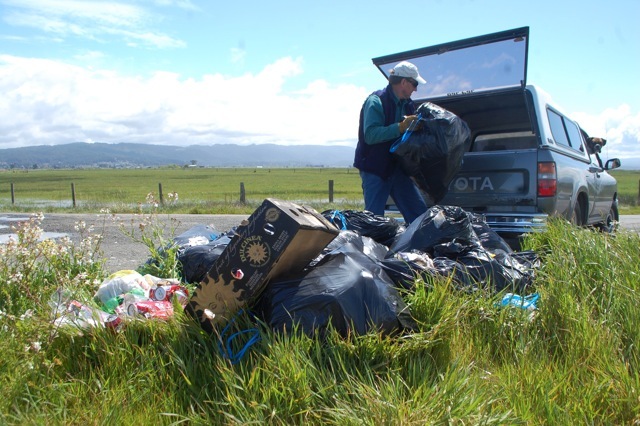 ARCATA BOTTOM – While Arcata’s brand-name environmentalists sit inside plinking on computers and planning parties, Ted Halstead is out on the Arcata Bottom taking hands-on responsibility for the repulsive wastes others dump into nature. It’s hard, lonely work, and Ted knows better than to make it harder on himself by indulging in self-righteous anger. At the same time, he freely disparages the bad actors who, under cover of darkness, foist their filth on the Bottoms. The slough-tossing is the most annoying and difficult-to-correct problem. It’s one thing to dump crap on the roadside, but polluting ths fragile waterway represents active maliciousness – toward nature. Cars, buckets of roofing material… nothing’s too heavy or toxic to dump into the water. You wonder what thoughts might pass through the dumpers’ minds as they hurl pollution into the waters. “I’m a good person” probably isn’t one of those thoughts, but who knows? There’s almost certainly some self-justifying rationale for the wrongness. What some may be thinking is, “This will never be traced back to me.” Evidence destruction seems to be the aim of the cannabis growers who throw their spent lighting ballasts off the bridge and into the slough. The old ones contain polychlorinated biphenals (PCBs). These carcinogenic chemicals bioaccumulate and bioconcentrate in organisms, causing all manner of mayhem up and down the food chain. Newer ballasts use copper, which could be sold for scrap, but no – into the slough they go. So do lots of other things. In fact, the range of items dumped along Jackson Ranch Road and into Liscom Slough would do the old Brizard Store in Jacoby’s Storehouse proud for the variety of selection. It’s an emporium of effluent out there, with meat-and-potatoes household trash, plus dirty diapers, bowling pins, a parachute, a didgeridoo, Jack LaLane-brand weights, a parachute, a player piano and even a walk-in safe left for others to clean up. The latter item was deposited by a marijuana grower, Halstead said. Police connected the perp to the safe, even bringing him to the scene of the grime to ask him whether he’d like to assist with the bulky item’s removal. He declined. “You can find anything out here,” Ted laughs. But that’s another problem – it doesn’t all stay there. In his Earth Day lecture at the Arcata Marsh Interpretive Center, Greg Goldsmith of the U.S. 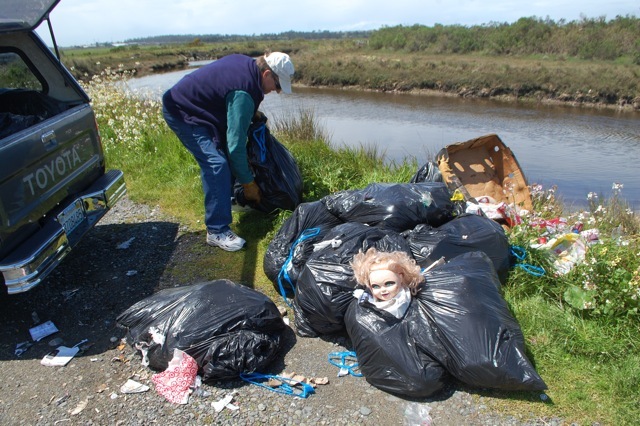 Fish & Wildlife Service explained how waterborne garbage from the slough gets int Humboldt Bay, then the ocean, where after 15 years or it becomes part of the North Pacific Trash Gyre. In the end, the expense in terms of labor and disposal is borne by Ted and his allies in the selfless Bottoms protection efforts. For effectively transferring the costs of their wastes to others, he acknowledges the unprincipled but cost-effective tactics of those who most people dismiss as idiots or worse. “I gotta give ’em credit for being economical,” Ted says. This entry was posted on Thursday, May 13th, 2010 at 9:54 am	and is filed under News, Community. You can follow any responses to this entry through the RSS 2.0 feed.